Best Buy (NYSE: BBY) is slated to join Staples (NASDAQ: SPLS) and Target (NYSE:TGT) by adding the Kindle to its inventory this fall. Just in time for the holiday season, the Kindle’s presence in Best Buy is predicted to boost its own sales, as well as the sales of its competitors. Speaking of competitors, both the iPad and Nook are available at Best Buy. There are rumors that the iPad might be hitting Target stores on October 3rd. Amazon (NASDAQ: AMZN) has been trying to distance the Kindle from the iPad by saying that the Kindle is for the more dedicated reader, while the iPad is for more general purposes. By doing so, this seems to put the Kindle buyer in one group and the iPad buyer in another. I wonder if there’s a way to make buying both appealing. After trying an iPad, I would use it more as a computer. The screen contrast is too great to read comfortably. Plus, the battery life on the Kindle is way longer than the iPad’s. With the prices becoming more and more reasonable, I think it is perfectly justifiable to own both a Kindle and an iPad. The Kindle and Kindle DX’s debut in all three stores allows consumers to “try before they buy.” Adding Best Buy to the mix will just put the Kindle out there to an even broader set of consumers. Best Buy is a natural fit for the Kindle because it’s reputation with quality electronics and good customer service. The Kindle DX has been tested with little success in universities, but there is hope for the future. It might actually serve as a good replacement for textbooks now that it is a little more mainstream and more readily available in stores. 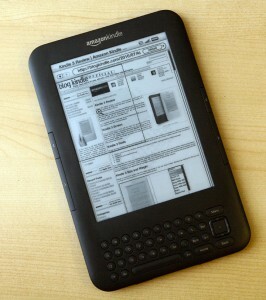 I think using the Kindle DX as a textbook reader would save a lot of money in the long run. It would also save a lot of space. No more bulky, back breaking bookbags to lug around! This entry was posted in E-Books, Kindle 3, Kindle Battery, Kindle Competition, Kindle DX and tagged Best Buy, electronics, iPad, Nook, Staples, Target by holly. Bookmark the permalink.